Temperature strips are temperature sensitive labels consisting of one or more small heat-sensitive indicators sealed under transparent, heat-resistant windows. What is the difference between Non-Reversible and Reversible Temperature stickers? As implied by the name, reversible temperature strips can change back and forth as needed to provide an indication of the present temperature. One advantage of the reversible stickers is that they can be used over and over again. Non-reversible temperature stickers are a one time usage indication that the specified temperature has been reached. Non-reversible stickers are useful in a situation where an operator is not available or does not have access to the sticker attached to a product under test. At any future time a non-reversible sticker may be examined to see if the specified temperature had been obtained. OMEGALABEL™ irreversible self adhesive temperature strips consist of one or more heat sensitive indicators sealed under transparent, heat-resistant windows. The centers of the temperature indicator circles will turn black at the temperature ratings shown on the sticker. The change to black is irreversible and registers the temperature history of the work piece. The exposed OMEGALABEL can be made part of the permanent record by removing it and affixing it to a service report. These conveniently applied and easy-to-interpret temperature indicating tabs find many industrial and military uses, as well as applications in research and development programs. 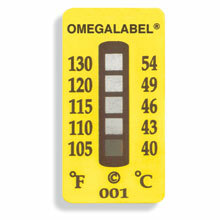 The OMEGALABEL will indicate a specified temperature or sequence of temperatures. The performance of the OMEGALABEL is typically not affected by transient contact with solvents, gasoline, fuel oil, lubricants, hot water, or steam. The OMEGALABEL is particularly useful in the solution of problems, which include: monitoring the safe operating temperature of equipment and processes; determining temperatures as a guide to design and material selection in research and development projects; determining temperatures as a guide to design and material selection in research and development projects; safeguarding temperature sensitive materials in storage and transit; obtaining operating temperature data of components and regions not readily accessible to other methods. To use the OMEGALABEL, remove the backing, exposing the adhesive; press the OMEGALABEL firmly to the work surface. No special treatment is needed for the surface, although it should be clean and dry to obtain maximum adhesion.